Every year the United States Conference of Catholic Bishops, in collaboration with 16 national Catholic organizations, organizes the annual Catholic Social Ministry Gathering (CSMG) around mid-February. CSMG is a four day national Catholic advocacy event that addresses issues and concerns for the Catholic community in the U.S. Advocacy is part of the social mission for the evangelization of the world. As in years past CSMG is an advocacy event that is rooted in the Word of God, the Sacraments, and the Church’s living Catholic social tradition. The event builds solidarity, knowledge, and skills among social ministry leaders in local arch/dioceses, religious congregations, Catholic educational institutions, and other national Catholic organizations. 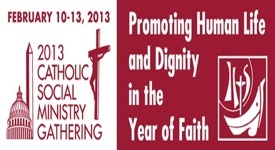 The theme for CSMG 2013 is “Promoting Human Life and Dignity in the Year of Faith” and following Pope Benedict XVI’s suggestion we will be taking the opportunity to deepen the link between faith and charity. Circle of Protection around programs that serve poor and vulnerable people at home and abroad. International Concern: We ask that the Federal Budget preserve international poverty assistance programs and to increase emergency assistance for refugee communities and disaster related regions. We also will request the Congress lift the FY 2012 hold on Funding for Palestinians to meet urgent needs. Domestic concern: During this budget cycle we will again be joining the ecumenical campaign that calls for a “Circle of Protection” on programs that help poor and vulnerable people – homelessness and affordable housing, workforce training and work supports, child and maternal health, school lunches – from budget cuts and the sequestration threat. We will advocate for a just immigration reform proposal that will provide a path to citizenship for undocumented persons in the country and preserves family unity as a corner-stone of our national immigration system. We also will advocate for the inclusion of the DREAM Act and AgJOBS and suggestions for our legislators to address the root causes (push factors) of migration, such as persecution and economic disparity. This year CSMG will be taking place from Sunday February 10 till Wednesday February 13. It will be held at the Washington Marriott Wardman Park Hotel in Washington DC. There will be workshops and advocacy training on Sunday and Monday. Tuesday is the actual advocacy day where we will be meeting with our legislators. Wednesday we have some final presentations that offer next steps for us to promote these issues within our own diocese and parish community. Please visit this link for information on CSMG 2013. This entry was posted in Human dignity and tagged Catholic Social Ministry Gathering, human dignity, year of faith. Bookmark the permalink.